It's a review about my latest Japanese wig from Aqua Doll! When I went to Japan, a friend of mine named Kayo wore Aqua Doll. I have also heard about this brand a lot! In fact I think it's more popular than brightlele.. The price is also slightly more expensive..
Because of curiosity, and I want to have a natural color wig because sometimes I want to get natural make up. So I got this one~! Original Aqua Doll wig came with their original box. Inside they store your wig with net, and also you'll receive pamphlet how to take care of wig [in japanese though] and hair net! So I am very amazed with the service! So AquaDoll, is a synthetic wig. But since it's made in Japan, it's made from their japanese synthetic viber so it is also very light and easy to use! The comfort point is same with Brightlele. I dont feel like my head is hot at all when wearing this wig. The shine can be reduced a little by patting some baby powder on synthetic wig though. But still.. I think dark color also looks more fake compared to light color for wig. The pic is taken with flash, but it's less fake than before, right? Therefore I have ordered another brightlele wig again hahaha! 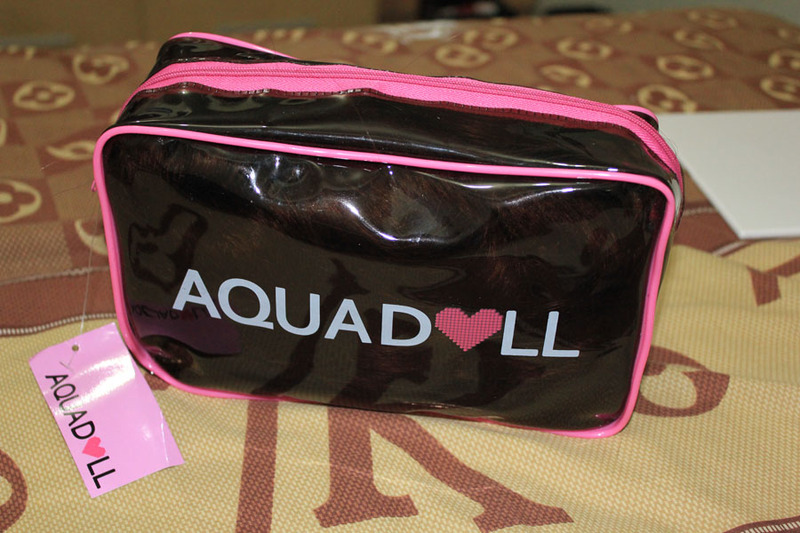 I hope now you have idea about the quality of Aqua Doll Wig! it looks natural on you :D very pretty! I don't know if it's just me, but I think it looks so fake lol..
Maybe I'm just not into wig..
U're prettier on your own hair, Stel..
At least I think so lol.. Thanks to you, I discovered Hazelnutz. I will be ordering one soon. I love wigs (and I just moved to Jakarta --- easier for me to order, yay!). Wow, i really like your blog! The wigs looks really good on you !!! Where do you usually buy your wigs? Cuz i buy mine at himecastle.com. they have pretty good Japanese wigs for a lower price too!